From starting off in 2011 selling fresh produce, BigBasket has become India’s freshest unicorn. BigBasket is now valued at more than $1.2 billion (Rs. 8,400 crore) after raising $150 million in its latest round of funding. Existing investor Alibaba put in $50 million, U.K. government-owned CDC Group put in $40 million, and South Korea’s Mirae Asset Global Investments invested $59.9 million in the round. The latest fund raise means that Big Basket has become India’s second unicorn of 2019 after Delhivery, and the first in the grocery delivery space. 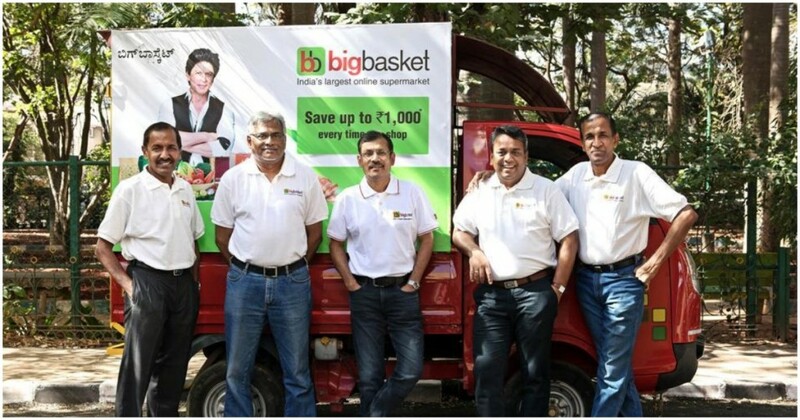 The unicorn status has been the culmination of a long, two-decade journey for Big Basket’s founders Hari Menon, V S Sudhakar, Vipul Parekh, Abhinay Choudhari and V S Ramesh. Big Basket isn’t their first entrepreneurial venture — all the way back in 1999, the team had started an online retailer called Fabmart, which is widely thought to be the first e-commerce company in India. They’d been far too early to the e-commerce game, and had eventually pivoted to a chain of stores called Fabmall. Fabmall was acquired in 2006, and the founders became angel investors. In 2011, they decided to regroup and take another stab at the e-commerce space. This time, BigBasket was born. Since then, BigBasket has turned itself into India’s largest grocery delivery app. The journey hasn’t always been easy — in 2016, several online grocery companies had been forced to shut shop, after they realized that they were bleeding money. In the span of a few months, Flipkart shut down its grocery delivery arm, as did Ola. Peppertap, one of the most prominent startups in the space, also downed its shutters. But BigBasket, which had been in business the longest, not only managed to survive, but also grew. This is in part because of BigBasket’s business model. The newer grocery startups essentially served as delivery fleets, with their delivery partners picking up items from supermarkets and delivering them to customers. BigBasket, on the other hand, focused on owning warehouses, from which it was able to deliver fresh produce and other items. This allowed the company to not only buy items at lower rates, but also utilize the economies of scale that comes with running warehouses and a large delivery operation. BigBasket today has more than 4000 employees, and delivers to more than 25 cities in India. It’s also investing heavily in marketing, signing on Shah Rukh Khan as a brand ambassador, and running TV commercials that feature the Bollywood star. But while BigBasket now has the lead in the space and a billion-dollar valuation to boot, there are other competitors emerging on the horizon. Amazon and Flipkart are both beginning to double down on their grocery delivery arms. Also, food delivery app Swiggy, which became a unicorn last year, has now entered the grocery delivery space, as has concierge app Dunzo. It should be a fascinating battle — BigBasket’s founders are all battle-scarred veterans above the age of 50, the newer startups were founded by entrepreneurs fresh out of college. It remains how BigBasket fares against its new competitors, but for now it can revel in its new-found billion-dollar valuation that was twenty years in the making.